When the King Father Norodom Sihanouk died the whole nation went into mourning. He died while receiving medical treatment in China. As his body was brought back to Cambodia, the Chinese government sent a Boeing 747 VIP plane to transport his body along with the current Cambodian King, his son, Norodom Sihamoni, the Queen Mother, Prime Minister Hun Sen and other important officials and royalty. 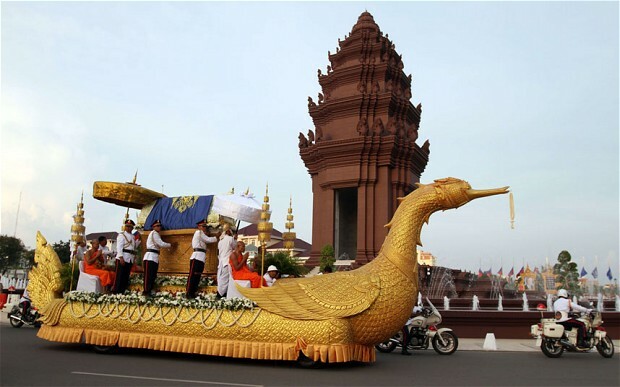 It seemed the whole nation stopped and the entire city of Phnom Penh went out to see the body of the King being returned to the Royal Palace. As the casket approached many people spontaneously broke out weeping and knelt along the street. As an American who has lived most of my life in Cambodia I felt sadness, but I was torn by the fact that my birth nation was founded when we rejected the King of England and any other kings that tried to lay claim to the New Land. I considered myself a proud American, subject to no man. Yet, I have spent the longest part of my life living in my new home, the Kingdom of Cambodia. Ever since I have lived in Cambodia King Sihanouk has been on the throne until he abdicated in favor of his son, the current King of Cambodia, a few years ago. King Sihanouk was King over a period of more than sixty years, therefore most Cambodians knew him not only as King, but the Father of Independent Cambodia. Let me tell you a bit about the history of our King Sihanouk. 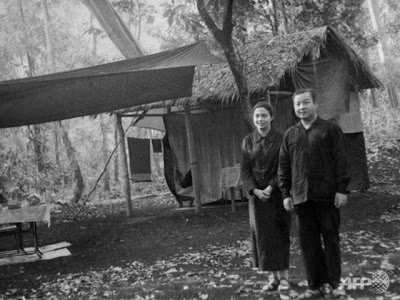 Sihanouk was born October 31, 1922 in Phnom Penh. He died in his palace residence in Beijing, China on October 15, 2012 just short of his 90th Birthday celebration. 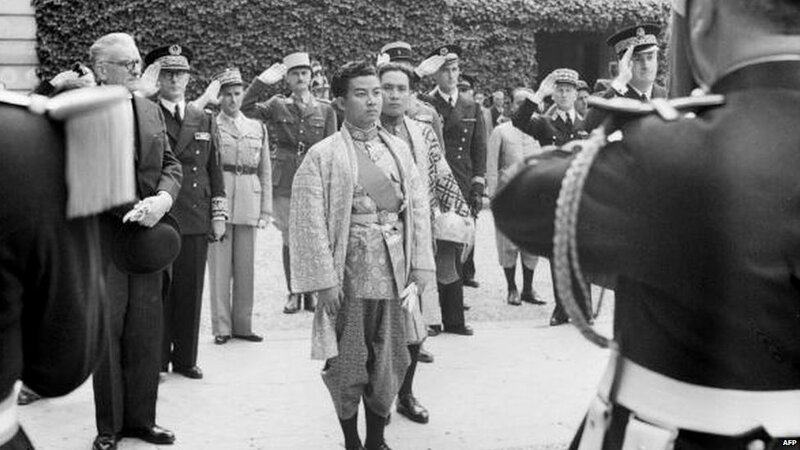 At 19 years old, then Prince Sihanouk was pulled out of school in France to become King under the French colonial government (then called French Indochina). In the 1950’s the Vietnamese started fighting against the French colonial powers and at that time King Sihanouk used all his influence and charisma to gain independence from France without a war. On November 9, 1953 he succeeded and the French withdrew leaving the Kingdom of Cambodia as a independent sovereign nation. He led the nation in seeking a unique Khmer identity which had been so intertwined with French language and culture for nearly a century that much of the Cambodian identity had been lost. During the next few decades was a politically turbulent time in which Sihanouk abdicated the throne in order to become Prime Minister and later the self-proclaimed life-long head of state. Until the current Hun Sen era, this was known as one of the most successful times in the nation’s history. During this time, however, any dissention and opposition was treated harshly by the socialist leaning King Sihanouk. This led to the US backed overthrow of the King in 1970. From exile he aligned himself with the jungle forces which had fought for years to overthrow him in order to return to power in Cambodia. From his jungle base he called young men to come help fight for him and the Army swelled from a few thousand to more than fifty thousand strong. The current Prime Minister, Hun Sen, was one of those young men who joined him. The jungle force became known for its name given to by Sihanouk: the Khmer Rouge (or Red Khmer). Sihanouk regretted this alignment more than any of his past decisions. Once the secretive Khmer Rouge came to power in 1975 they jailed Sihanouk and killed most of the royal family. The government later concluded that 3.1 million people died under the Khmer Rouge regime through a national census. Through negotiations at the UN the “estimate” was later reduced to 1.7 million because of international pressure. From the 1960’s Cambodia had been in a state of civil war with different Khmer factions vying for control of this newly independent nation. Though the nation was newly independent from France the nation was by no means “new”. The Khmer of Cambodia have had their nation since 60 A.D. and at its ancient height built thousands of temples across Cambodia including Angkor Wat nearly a millennium ago, which is known as one of the wonders of the world. The civil war continued as armed political factions rose and fell until 1997. Since 1998 Cambodia has been in peace with no more armed factions are fighting in the country. In this time of freedom and peace Cambodia has seen unprecedented prosperity and development. King Sihanouk was called upon again in 1993 to serve as King of Cambodia in order to help unite some of the various warring factions. To some extent it was a success and the monarchy will continue for at least another generation in Cambodia due to his final reign. King Sihanouk had been sick with various ailments, including cancer for most of his last reign so his death was not a surprise, however, the grief of the people has been unprecedented. As his body returned to Phnom Penh from China where he passed away, it seemed the entire population of Phnom Penh lined the roads to mourn the King Father. He is affectionately known as “Samdach Ou” which is quite literally the affectionate term “Daddy King”. He is the father of the modern independent nation and held in sacred esteem. Many people may be tempted to criticize the policies or actions of the King or attack his character, but I think it is best to just honor him as the King; my King. He is a man with faults like everyone and he did the best he could for the interests of the nation and the royal family. So, today I celebrate his accomplishments along with millions and millions of other Cambodians. Over 120,000 Cambodians are walking in his funeral procession while millions more like myself are watching the procession go by. From a young teenager King he helped a nation learn to stand on its own, struggle with their national identity, experience the danger of self-interest and the near extinction of the people though genocide. 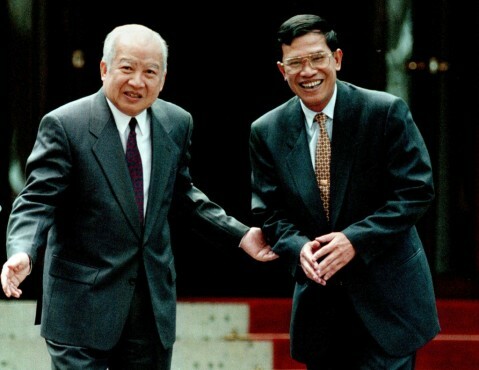 Through all the difficulties he kept Cambodia as his central concern. He saw this country grow to the modern nation today which is beginning to prosper and grow in their new freedoms. Through every step of the nation since the 1940’s King Sihanouk has been a central figure in the nation. ← Welcome to my world! A world without guns!